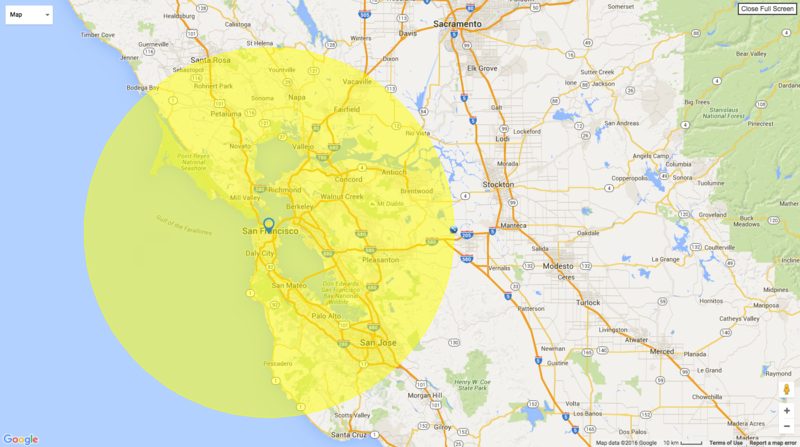 SF Bay Area - 50 mile radius for reference. Just wanted to initiate a Bay Area thread that might survive the test of time. I found a couple of old ones that don't seem to have been visited for months or years. Also found a couple of Nor Cal threads, but Northern California is pretty large so I thought it'd be nice to scope it to the Bay Area communities (for sake of definition, let's call it within a 50 mile radius of SF). So, roll call: who's around? Say Hi - introduce yourself and perhaps we can build a community for garage/shop recommendations, parts resources, tips, advice, share experience, etc. Let's get rollin'! Last edited by SURF150; 05-26-2016 at 03:27 PM. Reason: Added map image. Can anyone recommend either a mobile detail service or detail shop in the Peninsula? Any golfers on this forum in the area? Anyone here have an OEM Bed Extender they want to get rid of? BTW, I "migrate" from round about Burlingame down to Hollister. hey ya'll! anyone down to meet up, talk trucks and whatever else? Pleasant Hill is home, and SSF is work. Nice to see some activity, here! Admittedly, I haven't been too active on the forum for a few months, but I still get the email notifications of replies, etc. @Shelbie67, hopefully, our Bay Area community will start showing up and maybe we can do some sort of hang out. @SilentSteel, I'd like to get ahold of a used bed extender, too. Moving to San Jose in the next few weeks, would love to meet up with fellow F150 enthusiasts.